We woke at 7.00 am but struggled to get out of bed for another half an hour. Fortunately the monsoon shower head invigorated me and we were soon ready to experience our first breakfast in Taipei. The Green World Grand Nanjing hotel restaurant, located on the 2nd floor was called ‘Find the Life Kitchen’ and had modern furnishings. 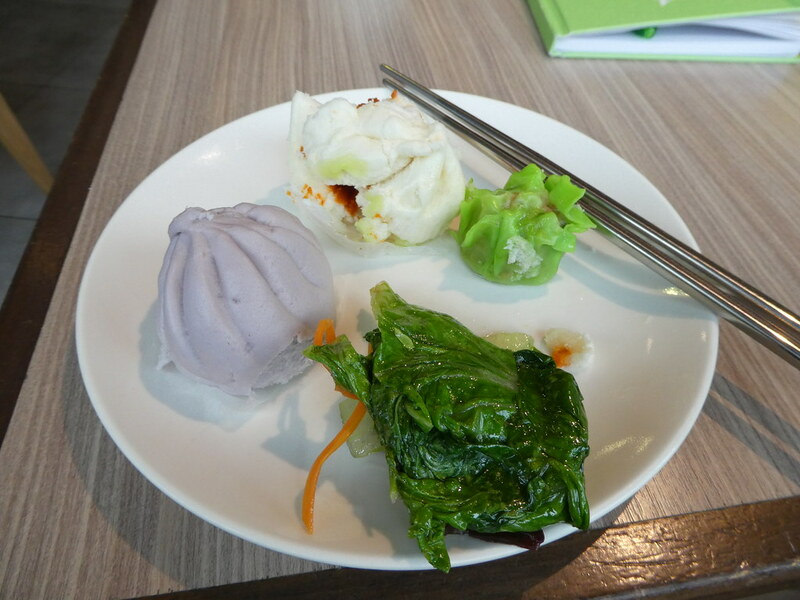 There was a good selection of Taiwanese dumplings in various colours (we were soon to discover the significance of this and how they varied in taste), noodles, eggs, other hot dishes as well as fresh fruit and toast. The coffee tasted good too, I dislike strong coffee but this was just to my liking and I happily returned for more. 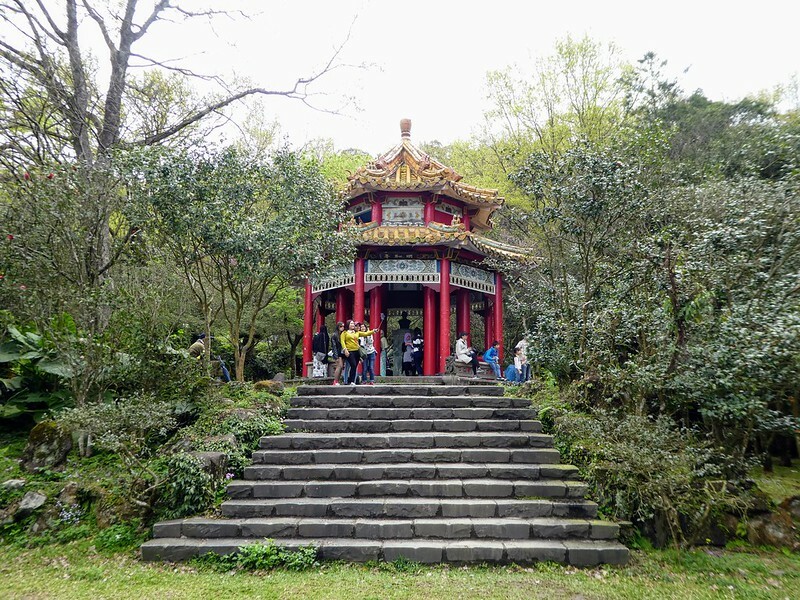 Having a full schedule ahead of us, we took the MRT to Taipei main station and then searched for the bus stop servicing route 260 to the Yangmingshan National Park as we planned to visit the final day of the Cherry Blossom Festival. 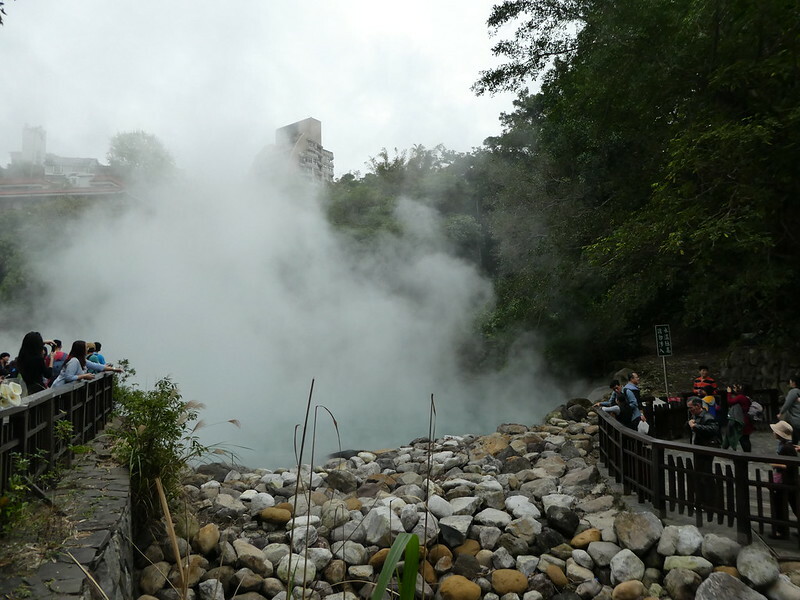 This volcanic park is located across parts of Taipei and New Taipei City and is famous for its cherry blossom. The bus taking 40 minutes, terminated by the Flower Clock which was very attractive and fully functioning. Cherry blossom trees were coming towards the end of their flowering season but still looked a beautiful sight. Being a Sunday and the final day of the festival, there were many people enjoying a day out in the warm sunshine, so warm in fact that we paused under a shady tree to apply some sun cream. In addition to cherry blossom, azaleas bloomed profusely and we followed the small paths admiring the flowers amid the delightful national park scenery. 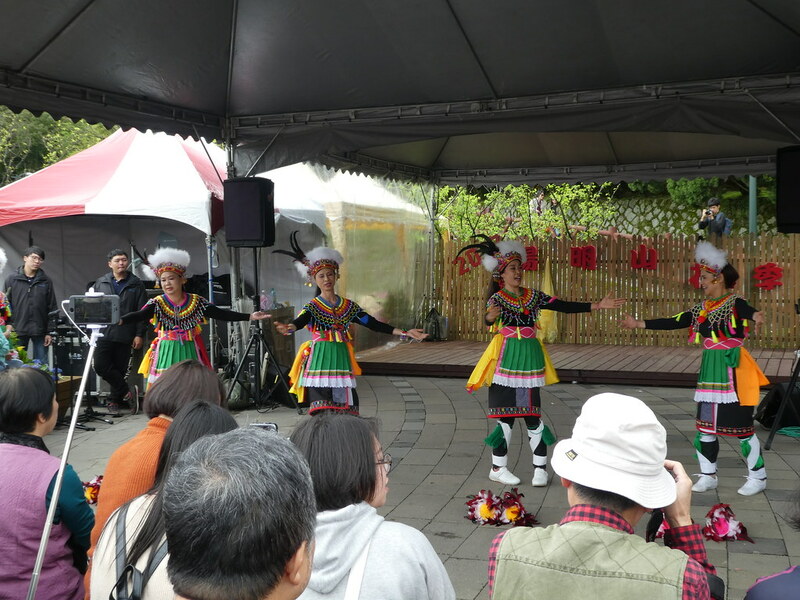 Coming across a stage we paused to watch some Taiwanese folk dancing and a local orchestra entertain us with some tunes. There were various cafes dotted around and we stopped off for our morning coffee in one of them. It had then been our intention to visit the Hot Springs but whilst queuing for our bus we noticed crowds of people waiting for other minibuses and wondered where they might be going. 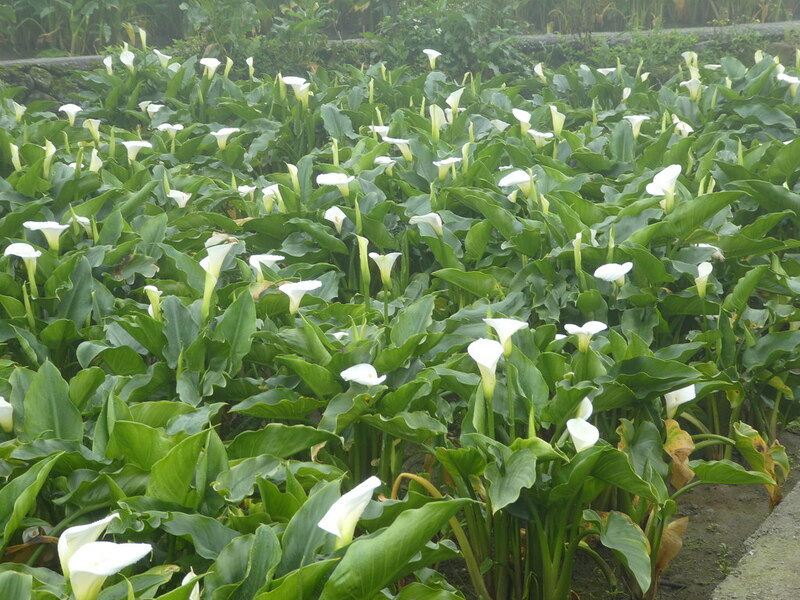 Fortunately for us, the bus station supervisor spoke some English and informed us that, at a higher elevation, it was peak viewing time for calla lilies and suggested we take a look. Joining the lengthy queue, by the time it was our turn to board a minibus no seats remained so we had to stand and hang on for dear life as the bus navigated the hairpin bends along its route. Arriving at the lily farms, it seemed utter chaos, the whole of Taipei appeared to be there, narrow roads were congested and people were everywhere. The only map we could find was in Mandarin and was impossible for us to understand so we asked a girl who had also been on our bus if she knew which way to go. She was actually from Singapore and it was her first visit too, but at least she could understand Mandarin and suggested that we follow the trails together which proved to be an excellent idea as she was so nice and interesting to talk to. There were fields of calla lilies as far as the eye could see and we followed a marked trail for about an hour admiring the blooms. Passing some street food vendors we bought some sweet, soft dough buns, one coffee and the other a sweet savoury combination of cheese and chocolate which tasted delicious and was recommended by our new friend. It was much cooler up here with low lying mist, so different from earlier in the morning when we felt the sun burning our skin. Bidding farewell to our companion we caught a minibus to Beitou, this time managing to get seats. Paying bus fares by EasyCard is quite complicated as sometimes one has to tap in when joining the bus or at other times one needs to tap in only on alighting and sometimes both – depending on the length of the journey. 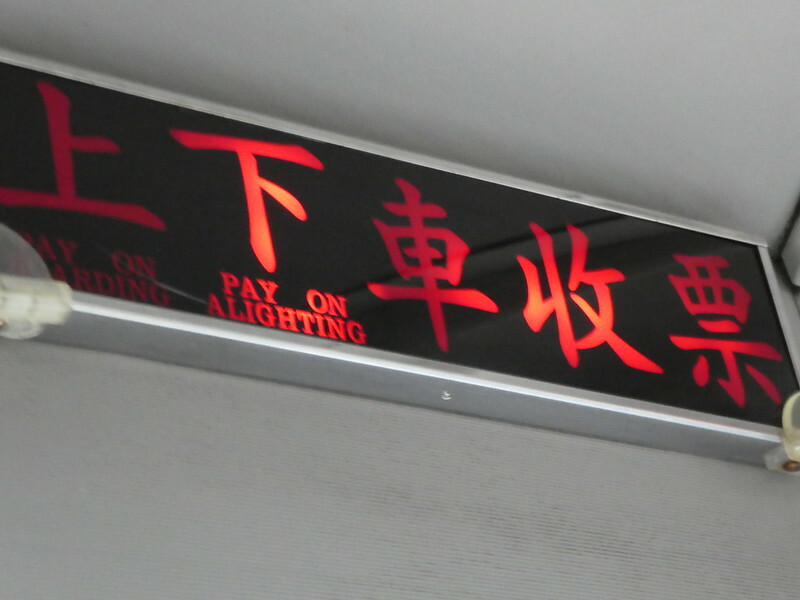 The above illuminated sign explains to passengers when they need to pay but there still seemed to be some confusion, even with locals. 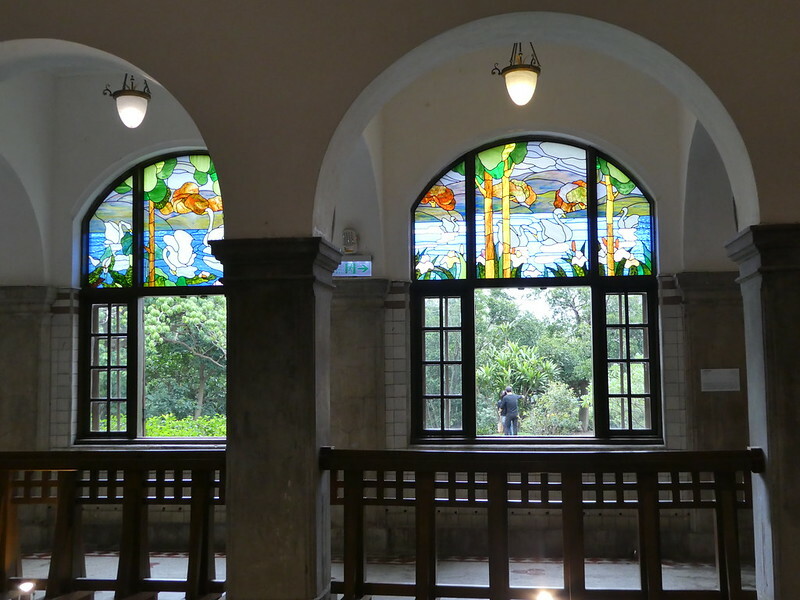 On arriving in Beitou our first stop was to the gorgeous public library which has been included in a poll of the 25 most beautiful libraries in the world (you can read the article here) and it was easy to see why. We strolled around and looked out from the wooden balcony where people were sitting on wooden benches reading. The library was busy with people working at tables and browsing book shelves which was pleasing to see and also that it opened on Sundays. 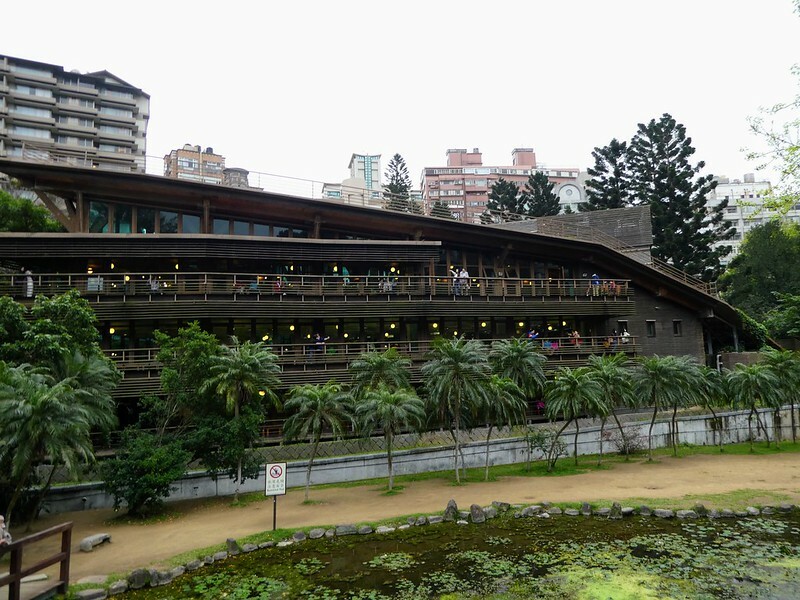 Next door to the library stands the Beitou Hot Springs Museum, admission is free but visitors are requested to remove shoes and wear the slippers provided to prevent damage to the polished wooden floors. 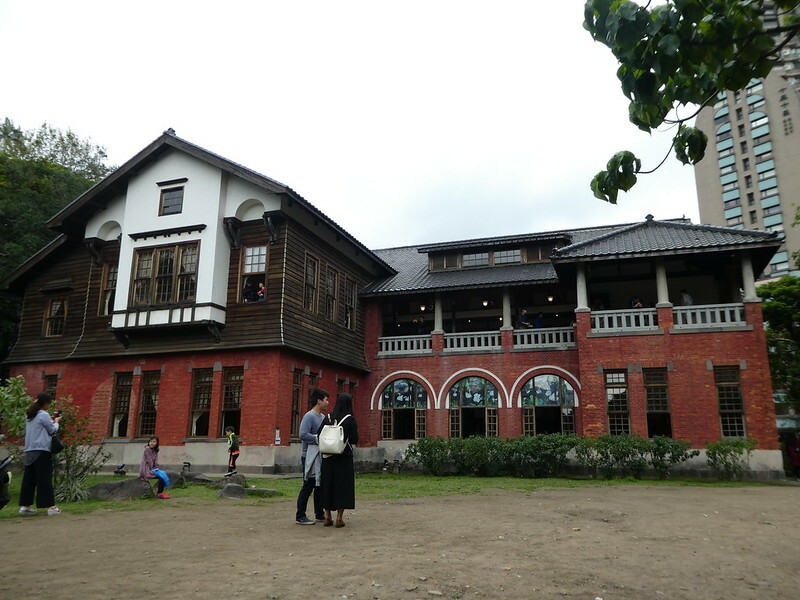 The small museum was very interesting and after learning something about the history of Beitou Hot Springs we went outside to follow the Beitou Hot Springs Trail where we were able to both smell the sulphur and feel the hot steam rising from the stream. 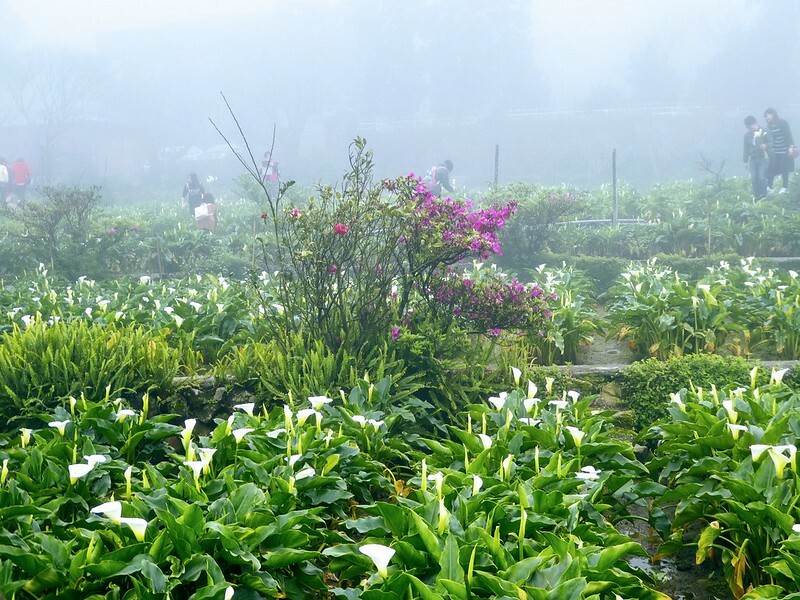 Combining visits to both the Cherry Blossom Festival in Yangmingshan National Park and the Hot Springs in Beitou worked well being only a short distance apart and with our unplanned detour to view the lilies we had still managed to fit both in without needing to rush. 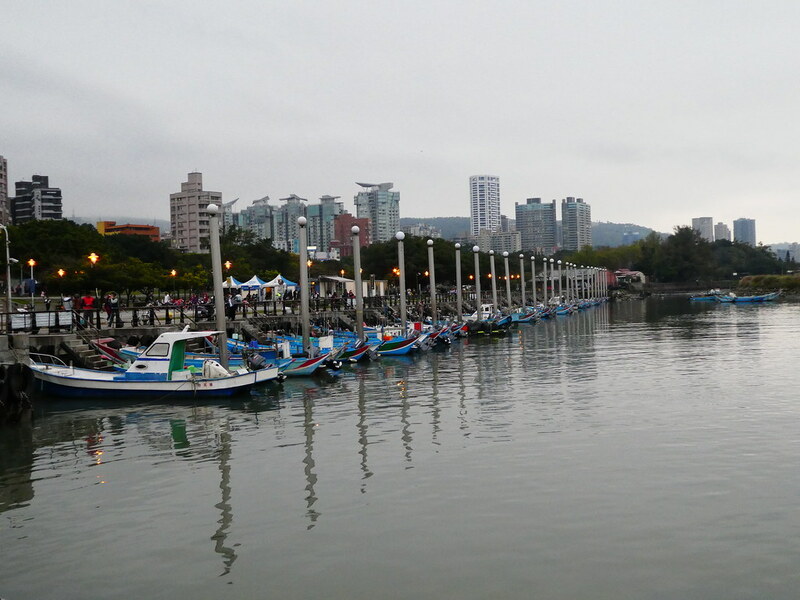 To complete our first full day in Taiwan, we took the MRT from Xinbeitou to Tamsui, a popular riverside resort in the north of the island on the banks of the Tamsui river, being a 40 minute metro journey if travelling from central Taipei. 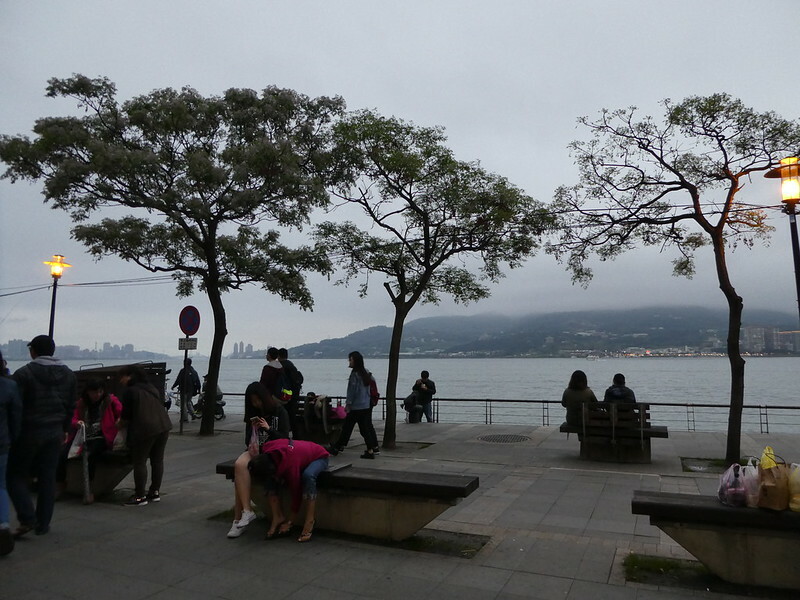 Darkness was just falling as we arrived in this lively resort and we enjoyed strolling along the tree lined promenade where we found a large number of food stalls to tempt us. 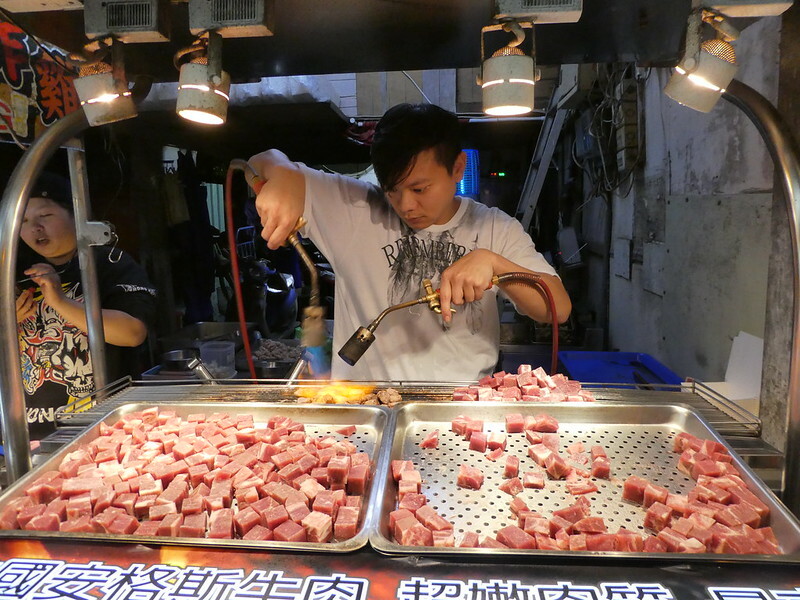 Ordering two steaks from a street vendor, he chopped the beef into small pieces and then cooked them to perfection using a blow torch, handing them to us to eat with skewers. A little further on some pork filled steam buns also tempted us, the dough being soft and the inside tender and juicy. From another stall we sampled some squid and for a sweet treat we bought two cakes to share – one with a vanilla filling whilst the other had a red bean paste filling. We both preferred the sweeter, vanilla cake but it was interesting to try the red bean to see how it tasted. Having eaten our way along the night market and experienced another fun filled day in Taiwan, it was time to return to our hotel and soak in the bath tub whilst watching television. 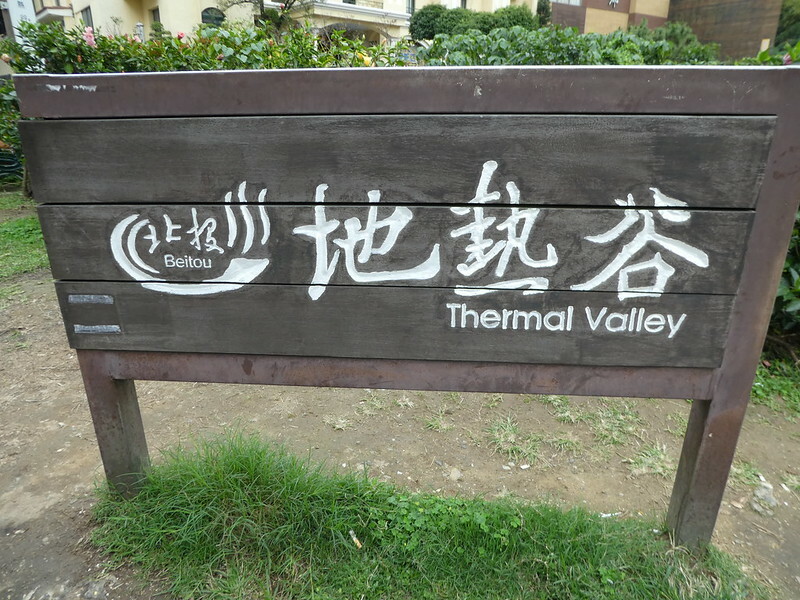 Thank you, we loved visiting Taiwan and Yangmingshan and look forward to returning again before too long. I studied in Taiwan for a year, and this brought back fond memories. 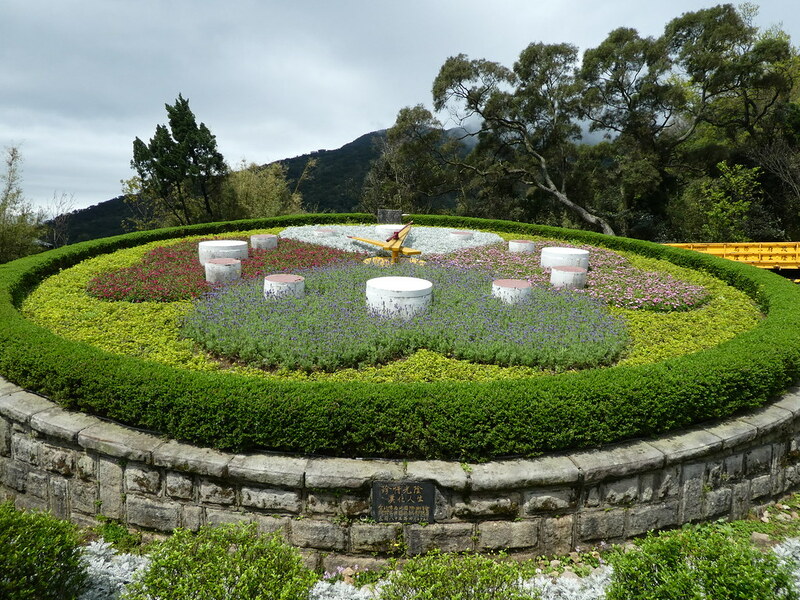 I have a clear memory of the Flower Clock at Yangmingshan. Glad to know that it is still functioning after all these years! So nice to hear from you Michael and t read that you have also seen the flower clock. We absolutely loved our week in Taiwan and can’t wait to return to explore more of the country! You write very well. And your photographs are very good. I enjoy reading your blog. Thank you Partha for your kind words, it’s so nice to read that you enjoy my blog and it’s accompanying photos. Thanks for liking my post on Syracuse, Sicily. Your photographs are wonderful, quite inspiring. Thank you too. I would love to visit Sicily sometime soon. Hi Marion, Thanks for stopping by and liking my first post! Your posts are so inspiring, like sliding glass doors to the places and experiences you visit. Thanks, and keep posting to inspire us! Thank you so much for your inspiring thoughts. I’m looking forward to seeing more of your photos, too! Love your captures. We’re heading to Taiwan this month. Can’t wait to explore it! I’m certain that you will have an amazing time in Taiwan. Thank you for your kind words. 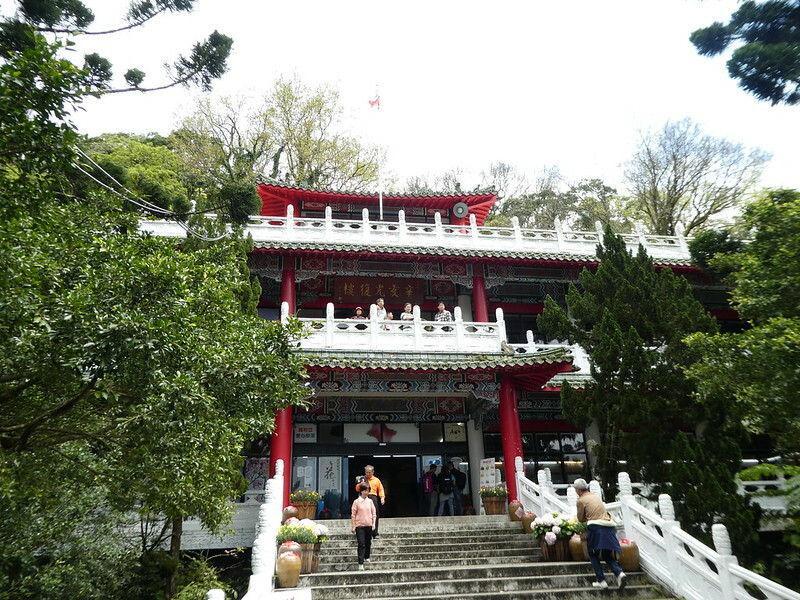 Yangmingshan is one of my favourite places, I’m pleased to read you liked reading about it. Thank you. Yangmingshan is gorgeous and I’d love to visit again soon. Yangmingshan National Park is beautiful. Thank you for your kind words. The library and the bath pics…very nice. Looks like they want you to spend a lot of time in the bath. is it comfortable sitting long hours in a tub??? 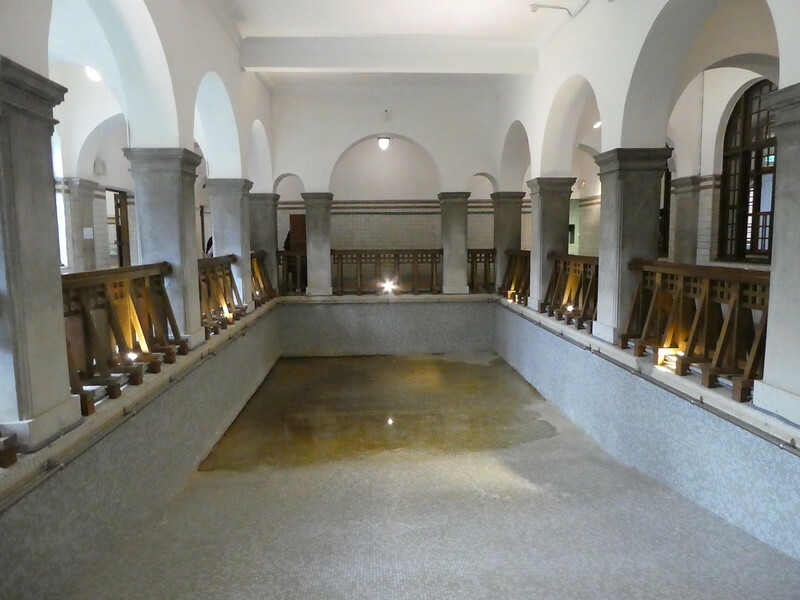 I’m not sure as we didn’t use the baths there at Benito, we just visited it. 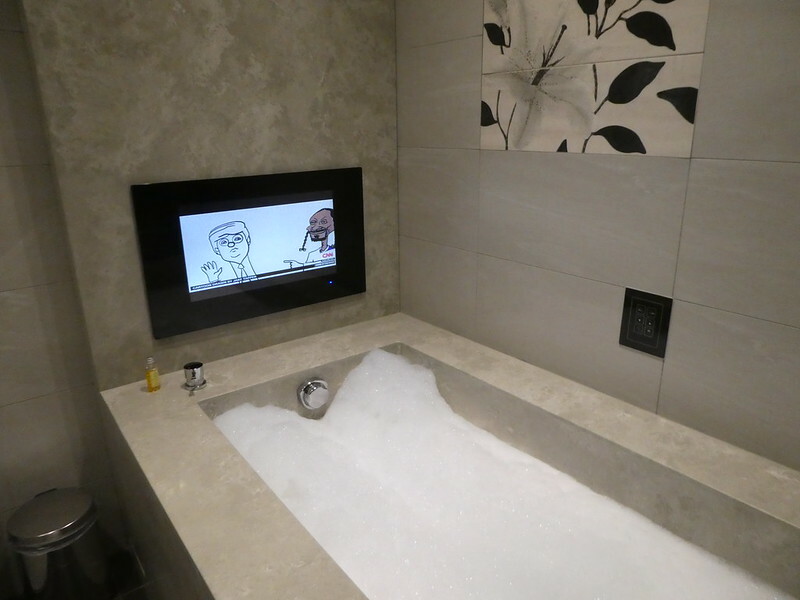 We did use that bath and it was nice to watch TV whilst bathing as it is so unusual. Is it comfortable being in water for long periods?? ?